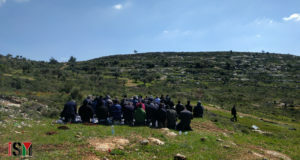 The weekly protest took place in Bil’in on Friday April 8th, as it has done every Friday for over a decade. Around 35 protesters, a mix of multi nationals and Palestinians, took part. 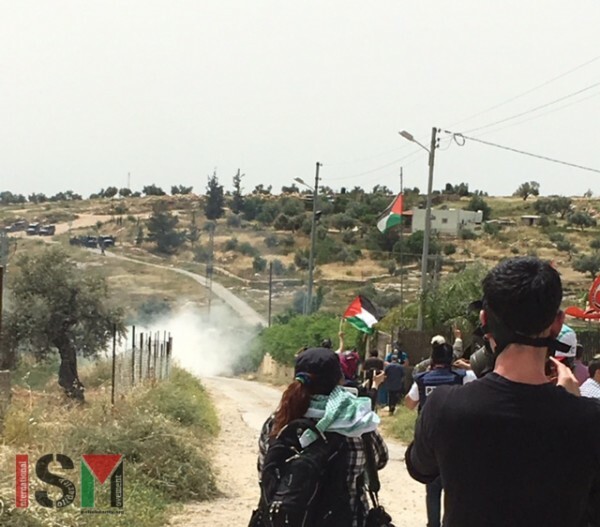 Very soon after the peaceful march started, the protesters were met with a hail of teargas delivered by approximately 10 Israeli Occupation Force soldiers and border guards who had arrived in five jeeps and were parked about 500 meters away. They continued to shoot teargas for about 20 minutes. One protester was overcome by teargas and had to be treated in an ambulance by medics. Bil’in is a village with a population of 1,800 residents and is situated 12 km west of Ramallah in the central West Bank of Palestine. It is internationally renowned for its weekly demonstration against the occupation and the building of the annexation wall. Frequent injuries, and even deaths, have occurred at this protest, and the Oscar nominated movie 5 Broken Cameras has documented the violence that the protesters continuously face. 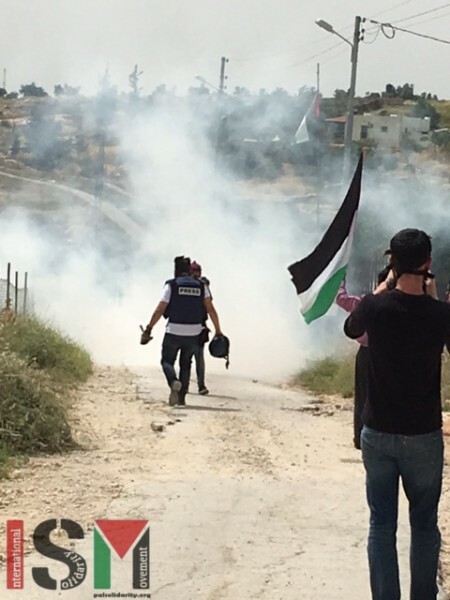 Peaceful protesters being attacked by Israeli Forces. One person needed medical treatment. Despite the death and destruction wrought upon the beleaguered villagers, they remain unbowed and continue to march every single week in an attempt to make their voices heard, and to bring international attention to their plight.